As the popularity of renewable energy grows, more studies follow to confirm or deny its ability to provide reliable energy to everyone. Not only is the discussion about green energy deepening, but the demand for more energy is growing as the population grows. So what can we as humans do about it? At West Coast Solar, we believe in solar power energy; it’s an alternative to fossil fuels. The pollution associated with solar is little to none, and it’s significantly less than fossil fuels. The conversation around global warming raises the question, “What can we do about it now?” We believe renewable energy is one way to reduce carbon-emission and help the future of our planet. Although alternative energy is the new buzz phrase, we still want to consider the pros and cons to better understand how we can advance green energy, which we will touch on in the following two-part blog series. One reason is carbon-emissions. As more carbon is emitted into the atmosphere, the negative effect of fossil fuels becomes more noticeable. It’s hard to deny the pollution factor traditional energy has on the world, even if you ignore the whole global warming conversation. Nonetheless, our team at West Coast Solar is focusing on how we can reduce carbon-emission, thus reducing pollution, and increase the number of renewable energy sources available to the public. Not only can green energy help the planet, but it can help the economy. You may find sources saying alternative energy cannot support the fossil fuel workers if there were to be a massive transition in the industry. Although this is a real concern, it’s also important to consider the number already employed in the renewable energy industry. According to the 2017 US Energy and Employment Report, 6.4 million Americans are employed in the energy sector, a five percent increase since 2016. The following 2017 US Energy and Employment States Report shows more than 200,000 employees in the Electric Power Generation sector alone. Although the green energy sector is a small percentage, it’s growing annually. West Coast Solar believes as the electric energy sector and the demand for green energy grows, so will the job opportunities. The economy has benefited from the design, manufacturing, and installation of solar power systems across the nation. Jobs have been created and filled, and the entire country is making an effort with green energy to create a better future for our children. What is the most efficient renewable energy source? As renewable energy becomes a more prevalent energy source, the efficiency and reliability are expected to increase substantially simply because bigger investments will push research and development forward. If we use a simple calculation, we can determine the most efficient energy source in use today. The equation includes the cost of fuel, production of energy, and the environmental damage. With this equation—and at the time of this post—we can see that wind is the most efficient energy source followed in sequential order by geothermal, hydro, nuclear, and then solar. Beyond these top five efficient energy sources, biomass, natural gas, oil, and coal come in at the bottom of the list in this order. 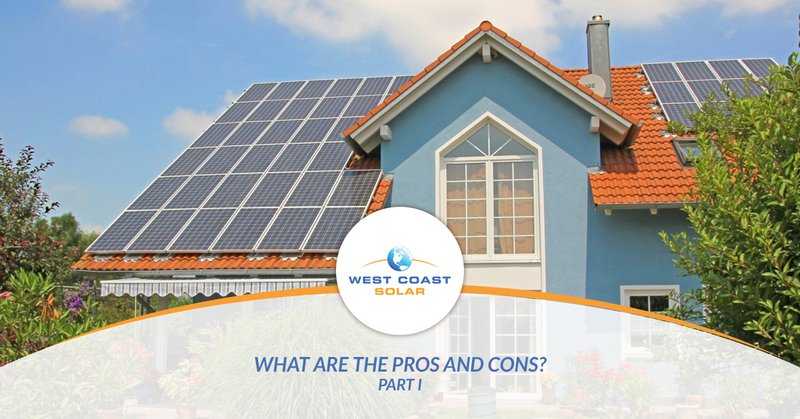 At West Coast Solar, we believe in making your home solar power system simple. Whether you need a new panel or entire custom system design, we can help. Green energy is our future, and we believe in delivering top quality products and the best solar service in Sacramento. Read part II of this series to learn about the pros and cons of green energy. Want to discuss your solar future? Give us a call!